On September 17, 2011, a small group of activists set up an encampment in Zuccotti Park, a tree-lined enclave in New York’s financial district, and started to “Occupy Wall Street” to protest against bank bailouts and corporate greed. At first the camp barely registered in the global media – a protest that involved living in tents for an unspecified amount of time seemed more likely to appeal to hardline activists unhindered by 9-to-5 jobs and bills to pay than the general public. But Occupy Wall Street took on a life of its own. 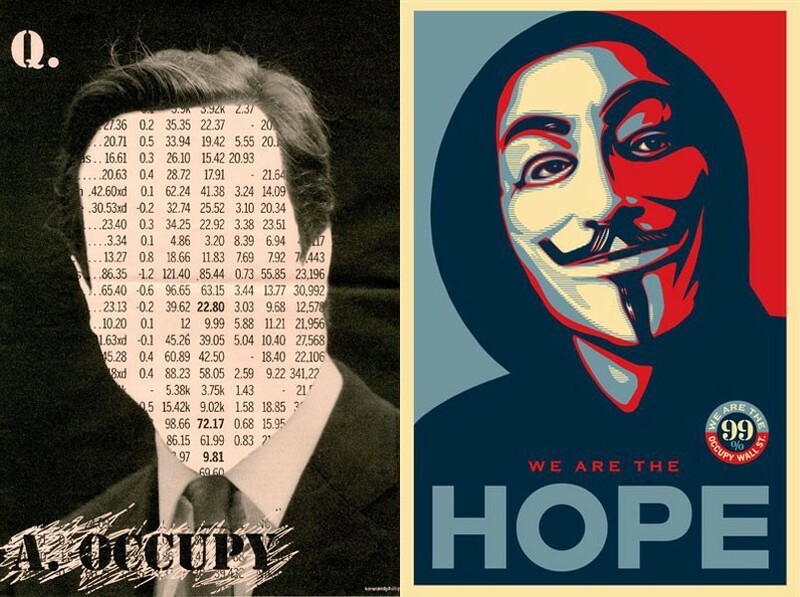 The hashtag blitzed through Twitter, and within a month over 900 Occupy protests had taken place globally as activists used their own social media channels to organise events from London to Mumbai, most of which were streamed live. Five months later, the global movement is still growing, having already changed the rules of contemporary protest and reclaimed spaces at the heart of our cities. Massive Attack’s Robert Del Naja, Radiohead’s Thom Yorke and Tim Goldsworthy from UNKLE and DFA recently played a secret DJ set for a small group of Occupy activists in the abandoned offices of global investment bank UBS. Del Naja’s involvement in Occupy isn’t much of a surprise considering his impressive political track record, which includes engagement with Stop the War and Greenpeace campaigns, a cultural boycott of Israel and work with prisoner rights charity Reprieve. Dazed asked Del Naja why he’s pledged his support. Dazed & Confused: Why play this gig? Robert Del Naja: I did a tour of Dutch and Belgian squats with Adrian Sherwood and Tackhead in the 80s. To be honest, it felt like the old days, like the Bristol warehouse party culture. We used to take over empty spaces, get a generator, fire up a sound system and party until the law came down heavy on us. But back in those days it wasn’t very political, it was more like a good excuse to have fun. The last thing Thom and I wanted was to turn up, put on a big event, have it all kick off, and then the police evict everyone. The whole thing would be totally destroyed. We wanted to do something to get involved and muster up support for Occupy across the Internet and the music world. D&C: Why do you support Occupy? Robert Del Naja: For years I had this romantic notion that when things got bad, we’d all go out and riot. Maybe it came from my punk youth and the Bristol riots in 1980 – listening to The Clash and this idea that chucking stones would somehow solve something. But when the riots happened last year, it was a very different story. I realised how frightening they were, how destructive, how pointless. Youthful exuberance was replaced with total sorrow and depression. People lost their businesses, you had a lot of kids in jail, it achieved nothing whatsoever. So when the Occupy movement started, I had a sense that it was the right thing to do. This movement has a lot of power and potential because it’s about ordinary people. D&C: Do musicians have a responsibility to take a stand? Robert Del Naja: Put it this way, it’s not a strategic career path (laughs). But I definitely feel a responsibility. I’m not the guy who’s caring for dying patients or feeding the poor, I’m just in the background playing music. If I’m lucky enough to do that, and can’t be bothered to do anything, then there’s a problem. D&C: How do you think Occupy differs from past protest movements? Robert Del Naja: When protests turned violent in recent years, it was a short term, angry statement. Smashing up windows, whatever - that victory is short lived, because the law comes down tighter. But with the Occupy movement, no matter how intimidating the law wants to be, it’s a basic right to peacefully protest against something we disagree with. And occupying a place is a form of pressure, isn’t it? When people remain in a space, when they remain visible, they can’t be ignored. D&C: What do you think Occupy’s most important message is to the wider world? Robert Del Naja: What I like about the movement is that there’s a coherent message, about equality in economics and democracy. It’s very important that people don’t think it’s just anti-capitalist, that would be absurd. It’s about effecting change in this system. There are still people who would very happily paint the whole Occupy movement as a bunch of leftie layabouts, which is insane. These people are actually the ones applying pressure so you won’t lose your income or your savings – so there are fair taxes and a fair economy. The activists are very focused, very organised, they’re intelligent people - they know exactly what they want and what they’re doing. Over the next few days, Dazed Digital will publish an interview with The Occupied Times' editor Steve Maclean and commentary from writer Laurie Penny, reflecting on the Occupy movement, the Bank of Ideas and the political climate of today - stay tuned!